Ukuran pratayang PNG ini dari berkas SVG ini: 800 × 533 piksel Résolusi liya: 320 × 213 piksel | 640 × 427 piksel | 1.024 × 683 piksel | 1.280 × 853 piksel | 1.350 × 900 piksel. 19 April 2010 22.53 1.350 × 900 (889 bytes) Zscout370 Finally got my hands on ISI 1:1968. The colors are in CIE 1931, so that will take a while to solve. However, this is what I got from the construction provided. Markup in Size 7 for the flag. 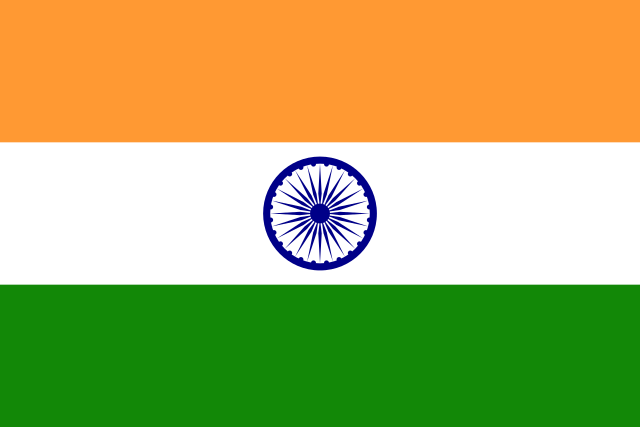 3 Oktober 2009 04.34 1.200 × 800 (1 KB) Zscout370 From downloadable files at http://india.gov.in/myindia/images/flag1.gif (Safron is still not legally defined when it comes to what it does look like, but the Government of India has flag images we can download and use).